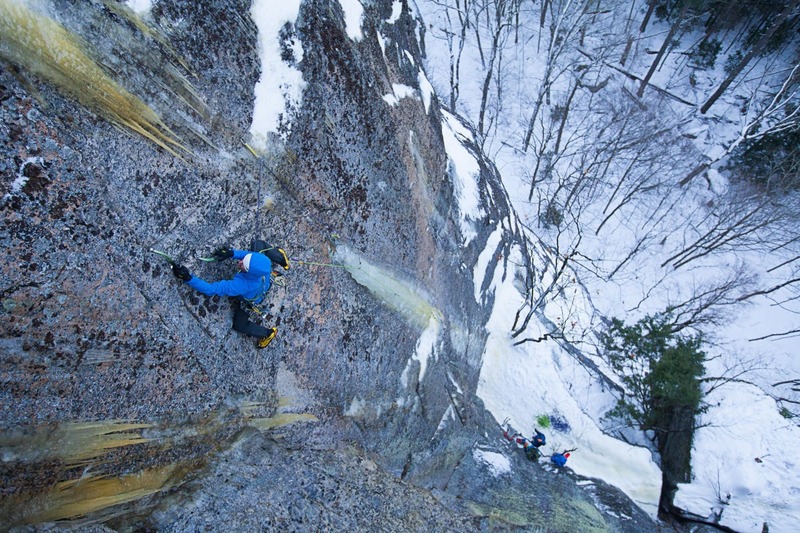 What happens when the ice runs out: scratching around on Cathedral Ledge, December 2014. I never know quite how to approach the early season. One year I started it off with a mellow romp up an area classic – Shoestring Gully – with good friend Elliot Gaddy. 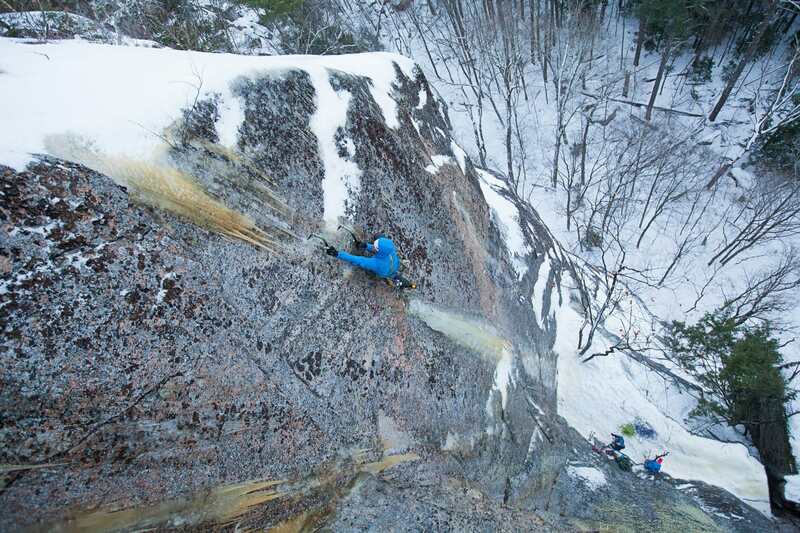 Thinking that got me dialed in, I then flung myself at some hard mixed pitch. Whoooa. That kinda backfired. Since then I have tried to take the same tack that I like for climbing trips – hurl myself at something challenging just to get the shakes out. I don’t like having something hanging over my head, best to just deal with it. 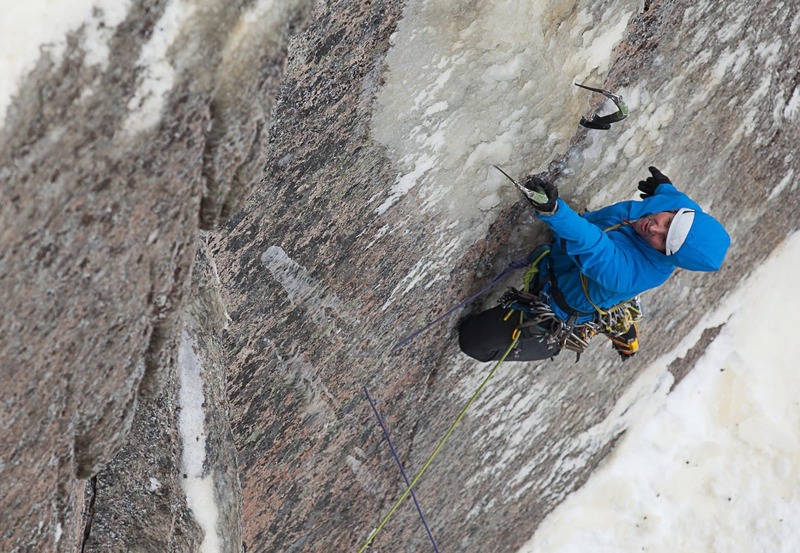 With winter climbing there is the added push of the fickle conditions. For our first pitch of this season, Sam Bendroth and I scrapped our way up Karen’s Variation on Cathedral Ledge to get up to some cool looking ice above the Blueberry Terrace. This was Peter Doucette and Ray Rice’s route, Cryo-Kinesis, which they pioneered a few years ago. Water was moving pretty heavily up there, so, in an act of unprecedented restraint, we decided to come back the next day after it had a chance to build a bit. Bayard channelling his inner Jedi on the thin-ice start to Cryo-Kinesis. Overnight was too cold for optimal building conditions, but the ice had sured up some. After a morning of work we took the fast track up, hiking to the top of the cliff and then rappelling in. I clipped a nut I had placed the afternoon before, right off the ledge, and started up some thin little ice bubbles. It was…scary, but I managed to find gear and keep myself on the wall – for a while. Lots of awesome climbing culminated in a less-than-shoulder-width-pillar. Everything went pretty well until I was about to launch into some pumpy, gently overhanging dry-tooling above the pillar. While placing a Camalot, my tool shifted and I went flying – fall #1. Once back in location at the top of the pillar, I tried a straight up version, which resulted in fall #2. Finally, now fully pumped, I saw the obvious line of holds out left. Ahhh.. that was the way, but i was pooped. Stellar line Ray and Peter! 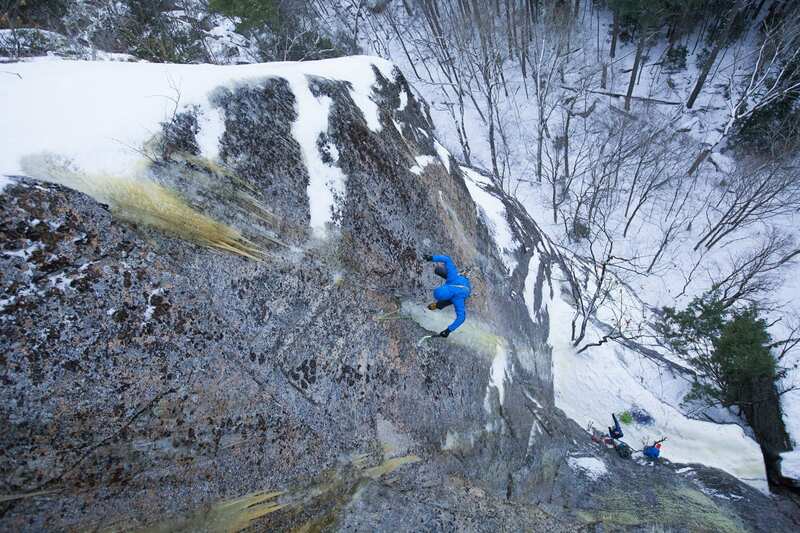 The top out – swinging into sticky yellow overhanging ice – would have made a true send so sweet. Fall #2. Cathedral’s flawless granite often provides good rock protection, making falls an acceptable risk on high-end terrain. Alas, the finishing moves are longer and pumper than one would have hoped. Words by Bayard Russell, images by Freddie Wilkinson, copyright 2014.